Arthritis is a chronic disease, which causes stiffness, pain and often swelling in and/or around joints. Cartilage, the protective barrier for joints begins to breakdown causing the bones to rub together which creates pain, inflammation (swelling) and stiffness. Arthritis can develop as a result of a broken bone, infections (usually caused by viruses or bacteria), autoimmune diseases or general wear and tear on the joints. 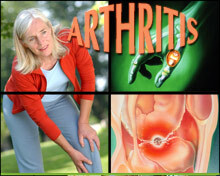 Arthritis occurs in both men and women. Osteoarthritis the more common type of arthritis is more likely to occur with age and is more likely to affect the hips, fingers or knees.